Moving Day is the National Parkinson Foundation’s annual fundraising event. It is a family friendly day, which includes a children’s area, care givers tent and variety of movement classes. Join the Marlene and Paolo Fresco Institute for Parkinson’s and Movement Disorder for their annual symposium. The night will be hosted by The Edmond J. Safra Parkinson’s Wellness Program and will feature artwork, presentations and workshops. Cheer on runners on Manchester as they raise money for Parkinson’s UK. All runners will receive a breathable running vest and a fundraising pack. 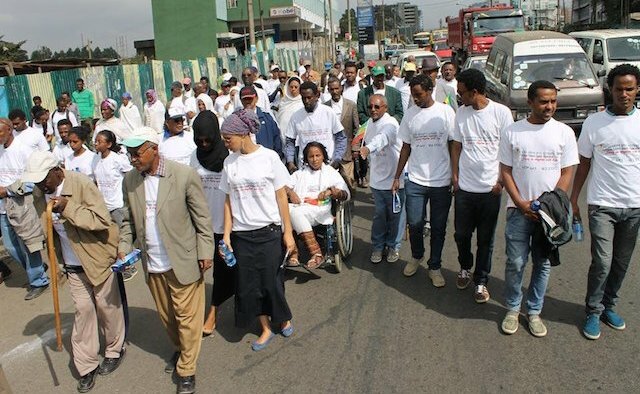 The 2017 Unity Walk takes the theme ‘We Exist’ and patients, the media, government officials and health professionals will all participate in the Walk. The organisation is also raising funds for 50 under-privileged Parkinson’s patients via their GlobalGiving page. Parkinson’s Awareness Week will be held from the 10-16 April 2017 to raise to raise awareness and educate the general public about Parkinson’s. Support packs are available to order. The EPDA, in collaboration with Parkinson’s UK, encourage all member of the Parkinson’s community to go online and share their experiences with the condition using the hashtag #UniteForParkinsons. Visit the website www.worldparkinsonday.com to find out more about how you can support the campaign – both online and offline. Greek playwright, Despina Anastasiadis stages a production of her one-act Parkinson’s play ‘Without Her’. The Heart is an optimist and tries to cheer up her friend the Brain who is mourning the disappearance of his favourite hormone, the Dopamine. An exhibition by the National Centre of Excellence in Research – Parkinson’s Disease entitled ‘200 years of Parkinson’s Disease research’ will be in the foyer of the train station Gare Luxembourg. Admission is free. A day at the races to benefit Parkinson’s causes. Learn how to read the racing program and place a bet by a ‘bet-ologist’. Hear speakers, see demonstrations, and bid on silent auctions before the main events. A panel of experts, led by Dr W Lawrence Severt, will discuss often-overlooked Parkinson’s symptoms such as runny noses and skin changes. Pre-registration is recommended. SymFunny is returning to the Royal Albert Hall showcasing a whole host of well-loved comedians and musicians including Jason Manford, Aled Jones and Katie Melua. All money raised will be go to Parkinson’s causes. The third annual Art of Fashion event will be held at Snap! Space, one of Florida’s premiere galleries. Hosted by local news reporter Allison Walker, guests will enjoy an evening of fashion and art, with food provided by an onsite sushi chef. Join The Cure Parkinson’s Trust team to raise money for Parkinson’s causes. All runners will receive a vest, wristband and fundraising materials. There will also be a cheer point area at the marathon, for runner’s friends and family. Guests are invited to enjoy an evening with British and Irish Lions Rugby head coach Warren Gatland. Warren will be joined by other Lions legends who will treat those attending to ‘behind the scenes accounts’ of former Lions tours. Invitees will also enjoy a three-course meal. This walking challenge follows the 105km coastal path around the island. You can sign up as an individual, team or run it as an ultra-marathon to raise money for Parkinson’s UK. Join The Cure Parkinson’s Trust for the annual Bluebell Picnic. Families are invited to attend Hedsor Park to support and well-behaved dogs are more thank welcome. The event will start at 12:00 and tickets cost £15. The National Parkinson Foundation’s Team Hope will be running year’s marathon. Those who join the team will be provided with a running singlet, blue shoelaces, a customised fundraising page and an invite to the pre-race dinner party for themselves and a guest. Members of the Parkinson’s Disease Support Group of the Mid-Hudson Valley will host their annual Walk Over Water. Since 2010 the group has raised more than $80,000 for the Parkinson’s Disease Foundation. The event will start at 13:00 EST. What's it like to think you had Parkinson's for nearly a decade?